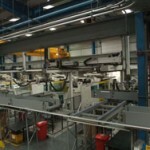 UPM have the company infrastructure to cater for total turn key conveyor systems operating worldwide with all aspects of manufacture carried out in house including fabrication; programming and control build allowing complete control of quality/inspection and maintaining delivery promises. UPM accept total responsibility for turn key projects operating to the agreed specification and to the customer satisfaction which is a result of Performance Guarantee allowing peace of mind with reliability and trouble free operation plus UPM liaise with other Original Equipment Manufacturers (OEM) to interface the system with the most efficient and economic product flow configuration employing the minimum of labour plus an overview of the system can be with a central PLC touch screen control ensuring the system is user friendly and simple for the operator who would have access to a slave panel in the production area. The system may comprise different types of conveyor ranging from powered roller line shaft conveyors; gravity roller sections and powered plastic link belt conveyors dependant on the application and type of product being handled at that stage of the system.